Your safety and comfort is our number one priority, our two vessels offer you the very best for any application! “Its Complicated” is equipped with twin 4-stroke Suzuki 250 engines, allowing a quiet cruising speed of 40mph. Her stern has a large fix box with seating on top; custom upholstery wraps the gunnels and there is ample seating around the bow. Other comforts include a premium JL audio sound system, new Garmin electronics, underwater lights, dry space for storage, padded cushions, large t-top for shade, custom dive rack for tanks, and a swim platform with ladder. This vessel is in full compliance with all USCG UPV regulations and documented requirements. Vessel also holds USCG Auxiliary Inspection rating and NOAA Blue Star Operator rating. Also aboard is a DAN extended range oxygen kit and DAN Coast Guard rated marine medical first aid kit. Ready to Book this Boat? 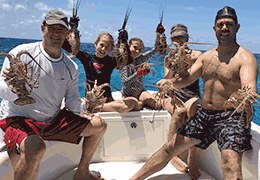 It's Complicated: The best ride for spearfishing and small groups! Call today to book this boat for your next charter in the Florida Keys! “Turn Tide” is equipped with brand new twin 4-stroke Suzuki 300 engines, allowing a quiet cruising speed over 30 mph. This 32′ boat brings all the comforts of home to the water with an air conditioned cabin, full service marine head, small kitchen, freshwater shower with hot water, and sleeping space for longer days on the water. 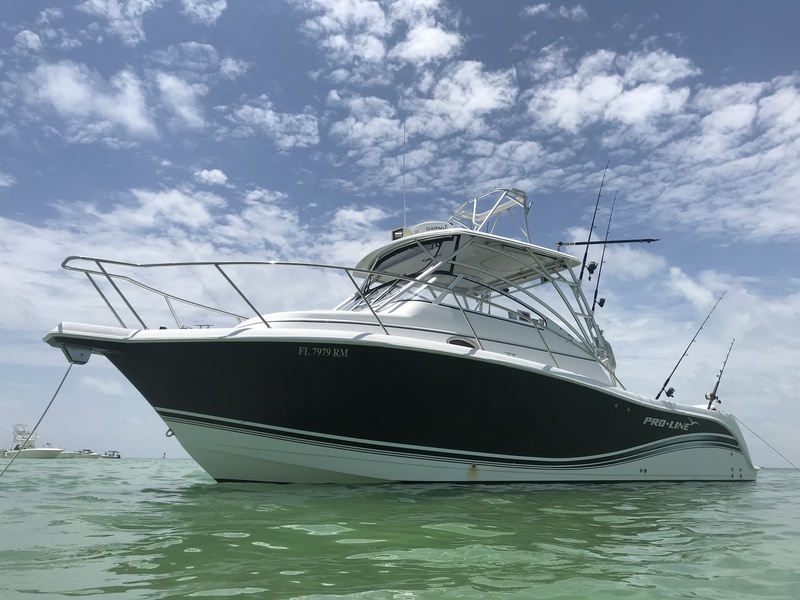 Other comforts include a premium JL audio sound system, new Garmin electronics, two large in-deck fish boxes, ample space for dry storage, plenty of seating with shade for large groups, and a custom dive ladder with handles.